In order to allow sailors who were no longer running after the Olympic Games or the World Championships to nevertheless prolong international competition, the 470 Internationale created the «Masters World Championship» in 1983 the first edition being held in Valencia (Spain). Entry was reserved for crews with a combined age of more than seventy years and the helm being at least thirty-five years old. 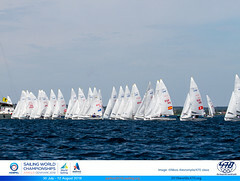 Twenty-seven boats from four nations took part in this first event where the Spaniards Rafael Iturrioz & Ignacio Dominguard became the first Masters World Champions. The Masters World Championship was held every year until 1997, then it became the Masters World Cup in 1998 and 1999 and then the Masters Cup at the request of ISAF. Claude Gachet & Pierre Honoré were the last Masters World Champions. 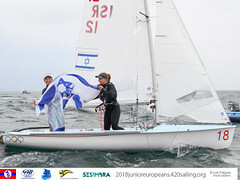 The event has always been held in Europe, except in 1996 when it was held in Doha (Qatar) and in 1999 in Auckland (New Zealand), on both occasions with boats provided by the organisers. In Doha, twelve nations were present from four continents, which is a record for this event. From 1996, the first «Grandmaster» of the ranking was honoured with a special prize. To qualify as a Grandmaster, the combined age of the crew must be more than one hundred years, with more than fifty for the helm. Then from the 2000 edition onwards, a new «Apprentice masters» category was created for crews with a combined age of more than sixty years, with more than thirty for the helm, who were not yet Masters. As for the first Grandmaster, the first Apprentice master of the overall ranking was also honoured with a special prize. 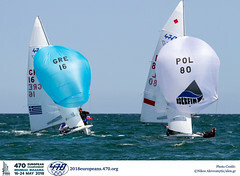 In 2007, the Cup was held in Roma (Italy) with a record participation of eighty-seven boats. Thereafter it seemed difficult to conserve a format leading to an overall ranking without the possibility of having qualification and final phases. A new format was adopted as from the 2009 edition, which consisted in organising a distinct ranking for each of the three categories. From the 2011 edition, a further category has been added for the «Grand-grandmasters» for crews with a combined age of more than one hundred and twenty years. The helmsman age criterion has disappeared, in accordance with the Class Rules which do not distinguish the helm but present the 470 as a boat for two undifferentiated crew members. The Swiss crew Martin Steiger & Hans Vonmoos have participated in nearly all the Masters events since 1987. They were crowned the best Grandmasters five times in the years 2000, then won the Grand-grandmaster titles in 2011 and 2012. The French Gilles Chapelin & Frank Barthe won the Grandmasters category four times. The Frenchman Bernard Boime won the Masters category four times, three of which were with Gilles Espinasse with whom he went on to win the Grandmasters category in 2012. The Spaniards Angel Gutierrez & Antonio Plaza Reyes won the Masters World Championship three times overall. The event has only been won twice by non-European crews, once by the women crew Jenni Danks & Addy Bucek (Australia) who won all the races in Auckland in 1999, and by the Apprentice masters crew Paul Foerster & Bob Merrick (USA) in 2000 in SaintPierre Quiberon (France) who went on to win a silver medal at the Sydney Olympic Games a few weeks later.